Ok. I finally got great resin bases from Micro Art Studio and I can continue to paint miniatures, but right now I have proper measures to finish most of them completely (it means I finally have bases for them, yay:). Next Friday I’m going to learn how to play Wolsung and I want to make a demo or tutorial game with my own painted and based miniatures. I have printed version of the rulebook – I had quick read trough it – and I can say rules are easy but appealing. The game should be fast and exiting. I don’t have any clue if it’s true and how the rules going to work in actual game – time will tell. All I know, I’m going to learn from the best – and I hope beside the tutorial we will be able to play more ‘normal and competitive’ game of Wolsung. For those who are not familiar with the game – Wolsung is a steampunk small scale skirmish miniature game located in fantastic version of Victorian England (XIX century). Few factions in the city of Lyonesse are in continuous struggle for power. The faction I chose for the start is Ash & Oak – secret club of nobles trying to protect the city from agents of foreign hostile super powers or other threats like far east triads. The world is full of machines, magic and races like dwarfs, orks or elves. All the fluff is amazing and is based on Wolsung RPG series – the game with many expansions describing all this amazing world. At the moment I am not able to say who is the strongest link in Ash and Oak faction and have no clue what are pluses and minuses, so I’m forced to experiment with those miniatures I owe and made the best of them. Not many models as you can see… First of all, they are more detailed than all GW range I’m used to paint and they are way more fragile. So, it takes definitely more time to paint those, and to be honest – I put much more effort to paint Wolsung’s miniatures. Skirmish games where all the models fight separately (not in huge block of warriors) give you this thinking – you need to paint every model as good as possible. Give the best of you. And no surprise – it takes time. There are also other projects beside Wolsung I struggle with – Skaven, Blood Angels and Infinity. All time consuming. Ok, enough with whining. 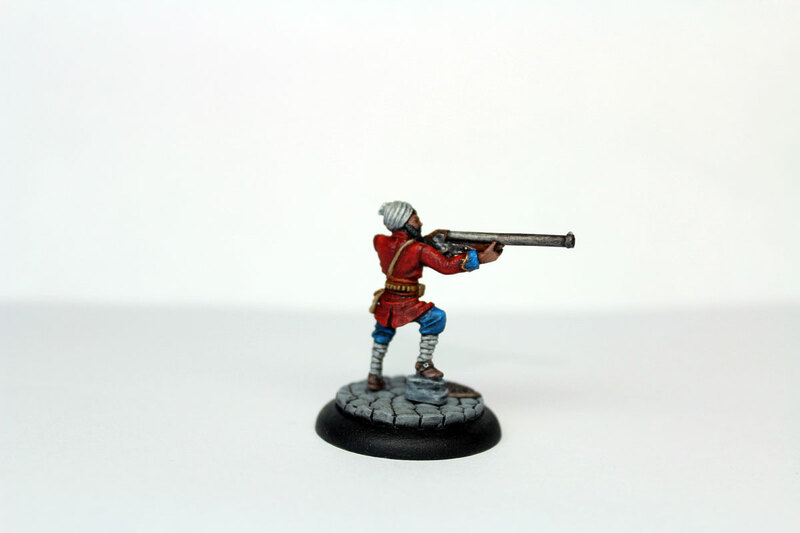 Let me present you my latest bloke for Ash & Oak – Abinav Singh. 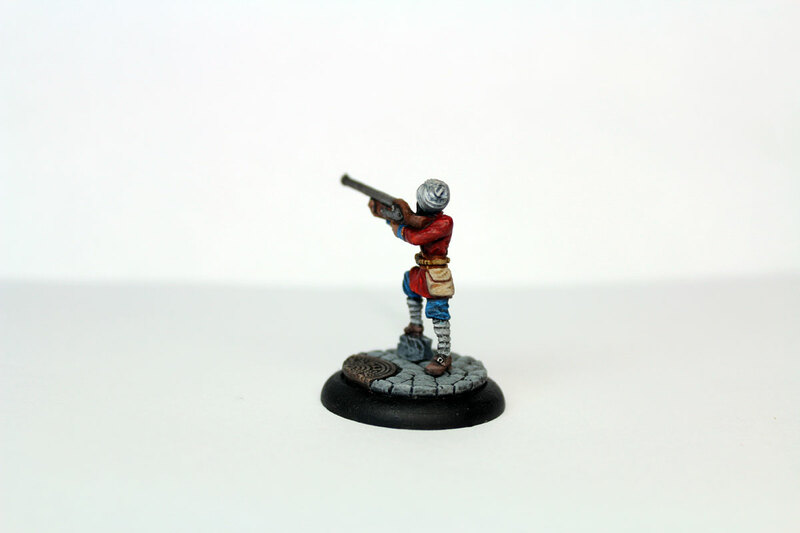 It’s my very first henchman painted. The game of Wolsung is organized that heroes can hire their henchmen. You decide with your opponent before the game how many heroes your band will include and each hero can hire several henchmen, depending on the available funds hero can spare on them. Abinav Singh is one of the finest henchmen in the game. 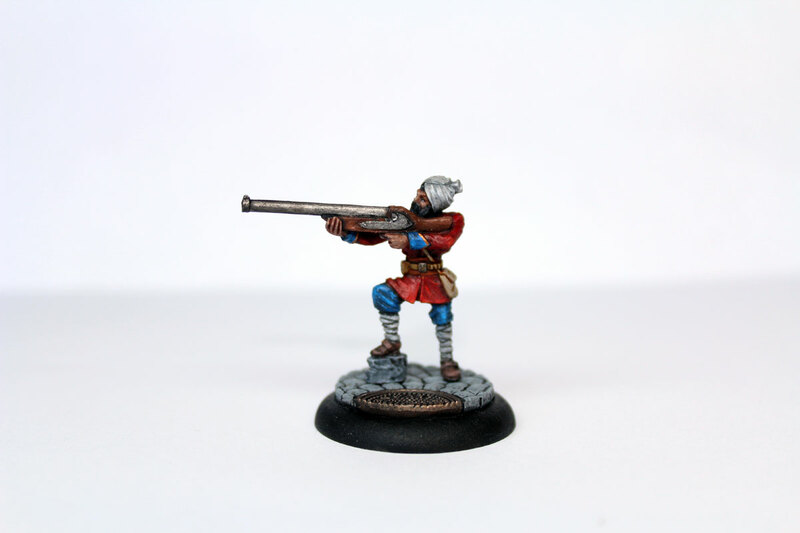 Perfect marksman designated to take care for Sir Zachary Fiercebatten III and to be his tutor (Abinav gives him re-rolls of shoot or close combat as long as he is in Abinav’s line of sight). Don’t know how I could make a use in the game yet, but already I can say – the model is nice. I tried to copy the colours of the photo from Micro Art Studio website – producer of Wolsung. I like the idea of combined red jacket and blue pants. For the skin – I mixed little bit Kislev Flesh and Gothor Brown (Abinav is Indian). And look at this cool base – it’s Cobblestone Round Base also by Micro Art Studio. The set is in the city in Lyonesse, so the base looks perfect for this – there’s even name of the city written on the entrance to the sewers. Sweet! Anyway – My Ash & Oak is growing! I already started to paint more henchmen – one bruiser and two butlers – I want to finish them during this weekend. Henchmen are generally less detailed than heroes, so it’s going to be easier task. 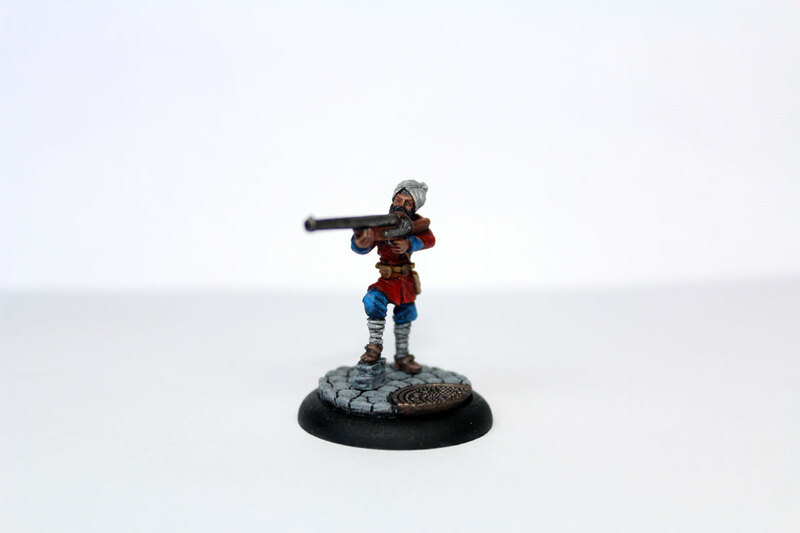 I want to have as many painted minis as possible for my tutor game, so after those I hope I’ll find free time to paint Mary Fearless – gun girl of Lyonesse. Another cool model. Still I need to add few minis to Skaven army – for two battles I have scheduled in upcoming days (expect reports! ), so we will see. And hey! Next week I’m off Warsaw and I’ll be back on the road again. At least for few days – heading Gdańsk (north of Poland) and few other minor cities. Just a runaway weekend, but as always it’s a perfect opportunity to visit gaming communities in new areas. Expect some special report here – for now, hush, but I’m already exited! Previous PostBases, bases, bases! Lots of bases!